The easiest way to fly in a total safeness environment. Flying with a tandem paraglider (a two seat paraglider) is an exciting experience, but also cool and reassuring. For this reason it is suitable for young people searching for strong emotions, but also for people that finally will find the way to realize the will to gently fly like an eagle sustained only by the air’s strength. Your tandem paraglider will be driven by one of our professional tandem instructors, and comfortably seated nearby him, in a total safeness environment, you will experience the emotion to fly. You will visit the sky without any noise: only the whisper of the wind around you. Booking your flight, for an extra cost, you can also ask for to buy an optional photo or video reportage of your flight, to show it to your friends and to taste once again the flight’s excitement once you’ll go back at home. It is possible to shoot wide angle images or HD videos of all the flight, take-off and landing. To fly with a tandem paraglider there’s no need of a special fitness. You only need to be able to do a very short run (three-four steps) for the take-off. A group of friends will be able to share one of the life’s most exciting experience flying with a tandem paraglider a few meters from each other. 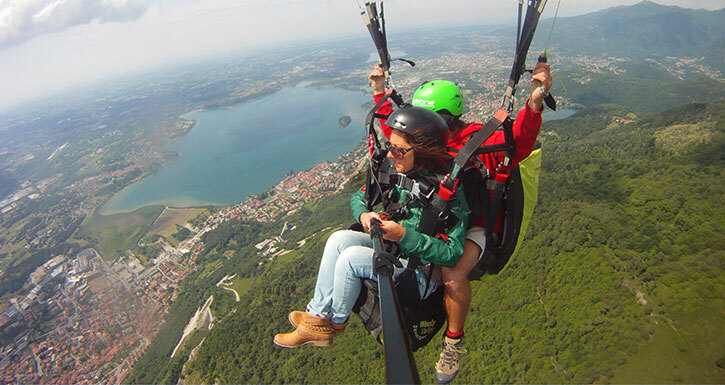 If you want to spent a San Valentino hundreds of meters above the ground, or you need to find an original idea for Christmas, or for your friend’s birthday, or even a stag night party, buying a tandem flight coupon is one of the best solution! Included: shuttle service, paragliding tandem flight, certificate of achievement and complete assistance from the pilot that will go along with you during the whole experience. Do you want to keep live all the most exciting moments of your flight with some amazing photos? More then 200 pictures where the main character will be you hundreds meters above the ground. HD videos of your experience. You’ll live again the feelings of your flight from your television or smartphone. The service includes the editing with your voice and music. Take a look at our Vimeo channel. We will give you all the necessary equipment. All you have to carry are you personal clothes. Just remember that the temperature on the take-off area is 3/4°C less then in town. Our office and meeting point is nearby the landing, in the Suello town, near Lecco and the lake Como. Just 30 minutes by car from Milan and 20 minutes from Como. If your family or your friends are curious to look at your flight, they will be able to rest at the “Cielo e Terra”, a nice and air conditioned restaurant-pub, just nearby our office and the landing, where comfortably seated with a drink or an ice cream or even a pizza they will be able to look at you from the take-off moment till the landing. "È stato un bellissimo regalo di compleanno! Guardare il mondo dall’alto è unico!Grazie mille!!!" "Grazie per l’esperienza che mi avete fatto provare è stata una giornata fantastica. Da rifare!" "Che bellissima esperienza con il parapendio!!! è uno spettacolo indescrivibile!!!"